Years ago, I was given a pair of spa slippers that were styled like flip flops. I thought it would be fun to make some for my mom, and this tutorial evolved from there. When I was given the "bath time" theme at SYTYC, I immediately wanted to make a pedicure kit, with these as part of the kit. 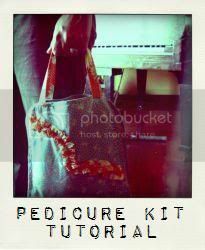 The pedicure kit bag tutorial will follow tomorrow. Gather your materials, including downloading and printing the template for the slippers. The template is made to fit size ladies size 7-9.5 (US). You'll find it HERE. 20" of non-slip material, the stuff I found is made by Jiffy. It was available off a bolt at my local fabric store. AND the secret ingredient...thick foam, like from a yoga mat. I think you could also use a favorite premade insole, too. Nice to have, but not required, basting spray. Step One. Cut out your pattern pieces. From the large size template, you'll cut your non slip and terry pieces. Just flip over for right and left. From the smaller size template, you'll cut your cotton batting and yoga mat pieces. You'll need two 1" by 27" strips of your cotton fabric. Finally, cut the ribbon or zippers to length. 13" each. Step Two. Assemble your slipper. First, sew the ribbon or zipper to the slipper. Next, sew the fabric strip to the terry, right sides together. Be sure the first piece of fabric has a finished edge, or is turned under. Sew the slipper top to the non-slip sole pieces, leaving the heel open for turning. As a matter of preference, I like to zigzag stitch the fabric strip's edge around the heel before I sew it all together. Now, turn the slippers right side out. Finally, sew the slipper closed. Repeat for the other slipper. It should be a mirror image of the first. When you sew this zigzag stitch, "walk" your machine through the zipper, or operate it by hand turning the wheel. You'll be a lot less likely to break your needle. Project complete. Be sure to tune in tomorrow for the companion tutorial! Linking up at The Girl Creative, Poppies at Play and Kojo Designs. Featured on One Pretty Thing, Craft Gossip, and Someday Crafts. I loved your Spa entry for SYTYC. It had my vote. Your tutorial for the slippers is great. I hate writing tutorial, they are a lot of work. Thanks. Those look super cozy! They are really cute. Thanks for entering the giveaway today! Now I need to browse over your blog!!! Very cool, I've never seen these before. Great tutorial too! HOLY COW Chris, you've been BUSY! Love this and the Pedicure tote. Seriously awesome.